Therapy dogs are an amazing teaching tool and help teachers reach students who have learning challenges of all types. The Nor’wester organization was happy to step up to provide a therapy dog team when Kate Irizarry, lead teacher of special education at Maple Point Middle School, asked for support. A class was chosen, and Heidi, a black Labrador Retriever, went to work! Results from this pilot program are very promising, as students are already reaping educational benefits. Susan reached out tentatively and poked Heidi’s ear before jumping backwards to what she considered a safe distance. She was afraid of dogs but really wanted to make the effort to touch Heidi. Repeatedly, she garnered the courage to approach Heidi. With direction from her teacher and the handler, Susan was guided in proper touching. She was shown how to stroke Heidi gently with the palm of her hand in the direction of hair growth. Slowly, as the weeks passed, Susan’s comfort level increased to the point where she was able to sit on the floor beside Heidi without becoming alarmed when the dog moved. In addition to starting to overcome her fear of dogs, Susan has benefitted from Heidi’s calm presence, which eases her anxiety issues. She has also learned to enjoy sitting by Heidi to read. Her oral fluency is improving by reading in this relaxed environment. Luke needs practice in communication skills. He is so excited about the therapy dog visits, that he goes home each Thursday and verbalizes all the details of what he did with Heidi that day. His mother is thrilled that Luke is sharing so enthusiastically. Luke’s teacher incorporates Heidi into her lesson objectives to help him improve his ability to ask questions, make appropriate comments, and converse with others. He is making great progress in sight word fluency by reading to Heidi while she snuggles by his side. At the end of the visit, Luke is rewarded with the opportunity to direct Heidi to “speak” and “lie-down.” When she responds to his commands, he starts to giggle. It’s so infectious that it gets everyone else in the classroom laughing. Then Luke takes a second leash attached to Heidi’s collar and accompanies the dog and handler to the front office. The visits are amazing motivation for Luke, and it’s been a joy to watch him progress week after week. Dominic needs lots of positive reinforcement, so his teacher designs activities around this goal. If he becomes anxious or agitated, he is invited to come sit by Heidi and stroke her. This proactive support increases Dominic’s engagement and motivation to work productively on academic goals and assignments. His whole demeanor changes as soon as the dog walks into the classroom. Joey needs motivation, so the teacher has wisely incorporated the dog into reading and writing assignments. Joey LOVES dogs, so just being on the floor with Heidi is a HUGE motivator, and it helps him to focus and produce. He wrote a story about Heidi and proudly shared it with his classmates. Scenario after scenario unwinds as Heidi continues her visits and becomes a regular fixture in the classroom. 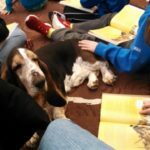 The teacher incorporates the therapy dog visits into establishing motivational goals for her students throughout the week and not just when the dog is visiting. 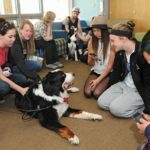 Therapy dogs are an amazing teaching tool and help teachers reach students who have learning challenges of all types. The teachers at Maple Point Middle School have become very excited about therapy dog visits in the building. We are already receiving requests from other classes that we have not been able to honor due to a lack of therapy dog teams available to visit in the area. So, if YOU have a therapy dog and are available to volunteer during the school day, please consider JOINING the Nor’wester Therapy Dogs organization! A bonus would be finding teams in the Neshaminy School District so we can grow our program there. More information can be found in the Get Involved section of our website.